An innovative solids management solution was used to dewater over 600,000 m3 of contaminated in Sao Paulo, Brazil. 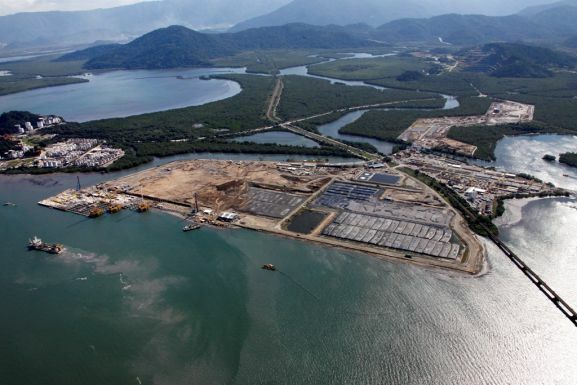 The material was then reused onsite for the construction of a large container and bulk cargo terminal. This approach, which combines dewatering and containment in a single process, enabled the team to dramatically reduce the amount of fill trucked to the site. They needed fill material to create an elevated foundation under the new container building. About 40% of the required 1.5 million m3 of fill was dredged from the Empresa Brasileira de Terminal Portuarios S.A. (Embraport) facility’s new entrance channel and pumped directly into Geotube® containers permanently arranged where the foundation would be formed. Not only did this reduce transportation costs associated with moving the contaminated sediment offsite, it also eliminated the need for the site operator to purchase additional land for a disposal facility to store the contaminated sediment. Three 65,000m2 dewatering cells were constructed to support 280 Geotube® containers, each of which is 213-feet-(65-metre-) long, to simplify the handling the contaminated sediment. Each Geotube® container was filled to a height of 7 feet (2 metres), allowed to drawdown in height then filled again. This process was repeated until they reached their final height of 5 feet (2 metres) and dewatered to a solids concentration between 62% and 67%. As the dewatering occurred, the filtrate from the Geotube® containers was drained into a collection basin and then pumped into a water treatment basin where the pH of the water was raised to precipitate heavy metals. It was then transferred to a second basin where the pH of the water was neutralized and passed through an activated carbon filter to ensure that it met the discharge standards required by the environmental permit for the site. Learn more about using Geotube® containers for dredging and dewatering contaminated sediments. Contact us to discuss your dredging and dewatering needs.